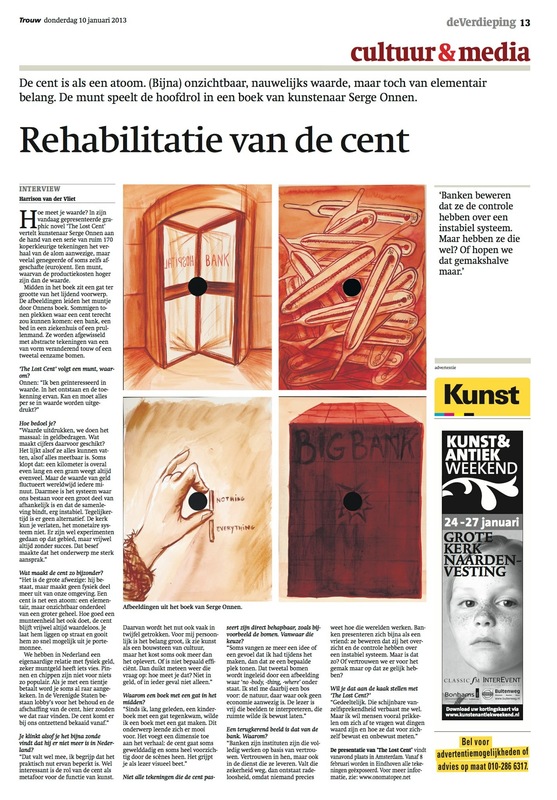 A graphic novel on the circulation of the cent. Everything of value is defenseless. * But what if a defenseless being is worthless? Like a cent. With less face value then its production cost, it could be the perfect object to raise questions about value. A valueless being; number 1, but a loser. It becomes problematic and unwanted. A homeless coin. A void that is not missed. Everything of value is defenseless. * But what if a defenseless being is worthless? Like a cent. With less face value then its production cost, it could be the perfect object to raise questions about value. A valueless being; number 1, but a loser. It becomes problematic and unwanted. A homeless coin. A void that is not missed. Famous around the world, it came back in many European countries with the introduction of the euro but failed dramatically. The cent is the least popular coin in any monetary world. It is alien in many countries. This valueless being circulates with difficulty. Picking up a cent from the pavement is not something you are supposed to do. Tipping someone a cent is an insult. Gambling with a cent is a joke. It plays the same game by different rules. Avoided like a virus, the cent is the interface to worthlessness. Its economic worthlessness liberates it from responsibility. Nobody cares about a cent. Like all our measures, currency is another convention we all depend on to run our world. A kilo is a kilo; an hour is an hour and a meter a meter. But while moving from place to place these realities lose meaning, volume and of course value. While currency is the fastest and most mobile of all man made conventions it’s value and meaning is always unstable and thus in jeopardy. Banks are like filters pretending to control this. Filters exist in many forms. Filters hold small things or let them through: Coffee filters hold back coffee grounds, walls filter sound, security cameras filter suspicious elements, human bodies filter air, liquids and food, hospitals filter diseases and banks filter money. Hygiene and precision are crucial during these processes and measurements. Control of measurements is essential. The last cent embodies a valuable process of filtering, measuring, distillation and fermentation. As the cent circulates between different monetary systems; from cash registers to wallets, to pockets, to the side of a couch cushion or some other dark and dusty spot; the cent gets lost and always goes down.